Dark, ominous storm clouds rolled off Lake Erie and barreled toward League Park. Black sky loomed over the ballyard, and rain, which had been falling lightly since the fourth inning, threatened to become heavier. The baseball game stirring underneath the clouds on this Sunday afternoon in Cleveland was nearly complete. The Indians led the visiting Philadelphia Athletics 2-1 in the top of the ninth inning. Caldwell was pitching a masterful gameon a day in which the Cleveland Plain Dealer had forecast “showers and cooler (temperatures).”The right-hander retired the first two A’s batters in the final frame as the storm grew menacing. A game which had featured little action and even less drama, suddenly turned into a frightening spectacle. The Indians had scored the game’s first two runs in the bottom of the fourth inning. The A’s cut the Tribe’s lead in half in the fifth when right fielder George Burns crossed the plate on a grounder by Cy Perkins. Burns had reached base after being hit by a pitch. Despite the run, Caldwell mostly cruised through 8 2/3 innings against the Athletics. Now, the A’s were down to their final out. Caldwell readied to throw to Dugan. That’s when the ruckus happened. A fearsome lightning bolt zipped from the overhanging clouds. Frightened spectators scurried for cover. The lightning, the Cleveland Press reported, had knocked off Indians catcher Steve O’Neill’s mask and hat, as well as Harry Davis’s navy blue A’s cap. Davis was coaching third base for Philadelphia. The strike was terrifying for the League Park spectators, too. Newspaper reports say lightning danced along the ballpark rails near where some fans were sitting and jumped toward the pitcher’s mound. Still shocked, figuratively and possibly literally, from the turn of events, players took their positions. There still was one more out to go. 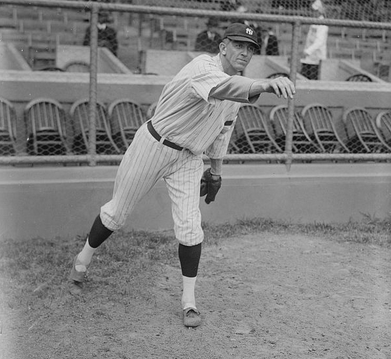 Caldwell pitched to Dugan and “forced him to hit a grounder to Gardner just as the clouds broke and the rain came down heavily,” wrote the Plain Dealer. Game over. Indians 2, Athletics 1. Caldwell pitched a complete game and allowed Philadelphia only one run and four hits. He struck out three and walked two. This, like a direct strike on a person, is unlikely, said Dr. Mary Ann Cooper, founding director of the African Centres for Lightning and Electromagnetics and professor emerita at the University of Illinois at Chicago, in an email interview on May 11, 2016. Dr. Cooper also wondered if the burns could have been fern-like, or Lichtenberg figures. Going into the contest, the Tribe had rolled off five wins in their last six games, The win over Philadelphia meant the Indians had kept pace with the American League-leading White Sox, who had also won that day, 4-1, over the New York Yankees. The Indians put together a run through the season’s remaining weeks, including a mid-September streak of 12 wins in 13 games that began with Caldwell pitching a 3-0 no-hitter against the Yankees, one of his former teams. However, the Indians finished 3½ games behind the White Sox, who went on to infamously represent the American League in the 1919 World Series. Caldwell’s electrifying performance helped spark the Indians’ late-season run. In six games with his new club, the big righty pitched to a 5-1 record with a 1.71 ERA, proving the Indians had made the right move in giving the 31-year-old pitcher another chance to prove himself. In addition to sources cited in the Notes, the author used the Baseball-Reference.com and Retrosheet.org websites and email interviews with Dr. Mary Ann Cooper, founding director of the African Centres for Lightning and Electromagnetics and professor emerita at the University of Illinois at Chicago, and Joseph Dwyer, professor of physics at the University of New Hampshire. 1 According to Cleveland.com’s weather history website, the high temperature reached 81 degrees in the city on the day of the game. 3 “Three Hits Off Caldwell: Indians Defeat the Mackmen, 2-1 – Pitcher Felled by Thunderbolt, New York Times, August 25, 1919. 4 Henry P. Edwards, “Speaker Refuses to Be Counted Out,” The Sporting News, August 28, 1919: 2. 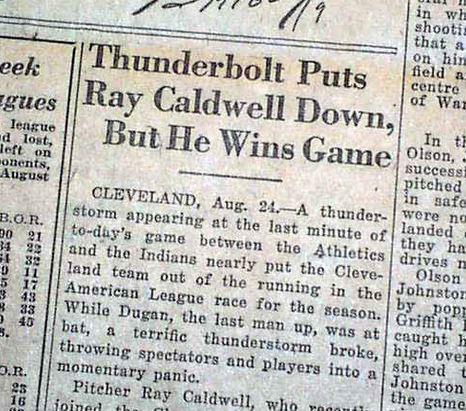 5 “Ray Caldwell Does Comeback and Hurls Tribe to 2-1 Victory of Macks,” Cleveland Plain Dealer, August 25, 1919: 10. 6 Henry P. Edwards, “Speaker Refuses to Be Counted Out,” The Sporting News, August 28, 1919: 2. 7 “Lightning Brings Near Tragedy for Tribe,” Cleveland Press, August 25, 1919. 9 “Lightning Knocks Down Hurler, Shocks Infield, Yet Cleveland Wins Out,” San Antonio Evening News, August 25, 1919: 8. 11“Lightning brings near tragedy for Tribe,” The Cleveland Press, Aug. 25, 1919. 12 Mike Sowell, The Pitch That Killed: Carl Mays, Ray Chapman and the Pennant Race of 1920 (South Orange, New Jersey: Summer Game Books, 2015), 100. 13 “Indians Still Sing a Song of Victory,” The Sporting News, September 4, 1919.